Greenpeace: Greenpeace study ranks Fukushima as Chernobyl level 7 of 7 on severity scale, not level 5 as announced by the Japanese government. Ted Glick post on Grist: Global heating causes earthquakes. ABC News: Unsafe radiation in contaminated milk and spinach samples taken as far as 75 miles (120 kms) from stricken nuke plant. 6.1-magnitude aftershock (last paragraph). …As we face the future, we must expect that natural disasters will continue to escalate in frequency and ferocity. Because we are making no serious collective effort to address the crisis of global warming, we are entering white water history and will experience an escalating cascade of crises that will shake the foundations of human civilization. Nature is seeking to redress a balance that human effort and technology has consistently violated for a very long time. She will continue to do so until we either change our ways and align human systems with natural systems or face the intensifying devastation of our modern way of life. …180 workers (since increased to around 500) rotate shifts, working at the plant in teams of 50 men — the Fukushima 50. “I mean there’s no — there’s no book you could take off the shelf and say, OK, if a 9.0 earthquake hit and then a massive tsunami floods the entire region where you are, what do you do? I mean this is the kind of contingency planning that I think most people did not believe was necessary. Well, we’re going to have to rethink that. If you look at the earthquake activity over the last 10 years, if you look at other weather problems that seem to have intensified over the last 10 years (scroll down for resources pertinent to this bolded quote), everybody’s going to have to go back to the drawing boards. And it’s not only about nuclear power, it’s about infrastructure, it’s about coal-fired plants, oil-fired plants. I mean we’re going to have to look very carefully at all of our pre-existing assumptions”. NY Times: A small crew of technicians, braving radiation and fire, became the only people remaining at the Fukushima Daiichi Nuclear Power Station on Tuesday — and perhaps Japan’s last chance of preventing a broader nuclear catastrophe. …They have volunteered, or been assigned, to pump seawater on dangerously exposed nuclear fuel, already thought to be partly melting and spewing radioactive material, to prevent full meltdowns that could throw thousands of tons of radioactive dust high into the air and imperil millions of their compatriots. “We are now in a situation that is different from yesterday’s. It is very clear that we are at a level six, which is an intermediate level between what happened at Three Mile Island and Chernobyl. We are clearly in a catastrophe”. Meanwhile, the US-based Institute for Science and International Security said the situation had “worsened considerably” and that “it may unfortunately reach a level 7 event”. A level 6 event means that consequences are broader and countermeasures are needed to deal with the radioactive contamination. A level 7 event would constitute a larger release of radioactive material, and would require further extended countermeasures. NY Times: …the nuclear fuel in all three reactors is likely to melt down, which would lead to wholesale releases of radioactive material — by far the largest accident of its kind since the Chernobyl disaster 25 years ago. 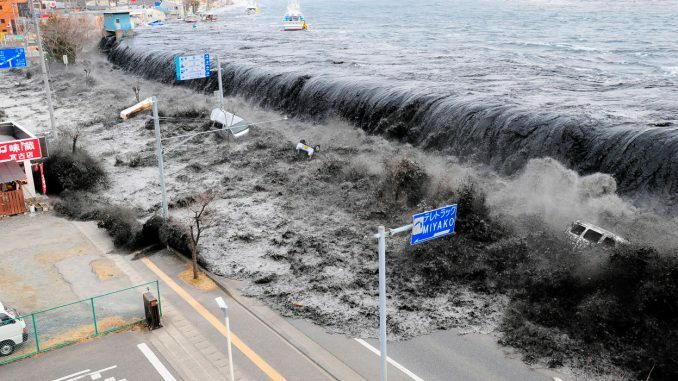 On March 11, 2011, a magnitude-9.0 earthquake north east of Japan set off a powerful, 7 to 10-metre (23 to 33-foot) tsunami that devastated the north and east coastline of the country and killed (or missing) more than 28,000 people and counting. It has become the world’s most expensive natural disaster on record, now at $310 BILLION in damages. MILLIONS of people went days with little electricity, water, food or heat in near-freezing temperatures. Hundreds of thousands were left homeless. And authorities are in a race against time to prevent multiple nuclear reactor meltdowns in what the Japanese Prime Minister characterized as the nation’s worst crisis since World War II. Over 260 aftershocks of magnitude-5.0 or greater followed what was the largest recorded earthquake in Japanese history and the 5th largest globally since 1900. Japan is the world’s 3rd largest, most debt-ridden economy, and largest net food importer in the world. 23% of its 127 million population are 65 or older. It has 18 nuclear power plants and 54 nuclear reactors. A full meltdown and chain reaction in the nuclear material at the troubled Fukushima Daiichi nuclear plant could threaten an area up to 200 miles from the complex. Tokyo (13 million people) is only 140 miles (200 kms) south. The tsunami reached as far as 20 kms inland and spread along 670 kms of the east coastline. The quake left a gigantic rupture in the sea floor, 217-miles long and 50 miles wide; shifted Japan’s shoreline up to 2.4 metres (8 feet) in places; altered Earth’s axis by 10 cm (4 inches); and sped up Earth’s rotation by 1.6 micro seconds. Not sure which was more indicative of our suicidal global denial and mass-consumerist insanity: The surreal experience of hair product or other inappropriate ads auto-playing online ahead of video footage and on news pages that exclaim, “Race against time to prevent multiple nuclear meltdowns”, OR the fact that Japan has built and operates 54 nuclear reactors in the most active seismic zone on the planet! The additional material below includes a list of collected sources that suggest the possibility of potential connections between *some* seismic activity and global warming (heating).